Are you looking for a good name for your photography business? Having a business name can make it official: you are a bona fide, professional photographer. In this article, we’ll show you how to find the perfect name for your photography business. Your photography business may have started off as just a hobby. Perhaps you began by shooting your friend’s wedding, and then you gradually started taking on some actual clients. But now, you’re ready to become a professional photographer. It’s time to name your business! There are a few factors you should consider before you choose a name for your photography business… Let’s take a look at each one. Your particular specialty–whether that’s wedding photography, portrait photography, or food photography–should help to dictate the name of your photography business. For example, Dreamlife is the name of a wedding photography business in New York. The name “Dreamlife” was aptly chosen because it evokes the elegance of a wedding, and the enchanting moments they capture between the bride and groom at the beginning of their new life together. Focusing in on one niche will help you to find the name for your photography business easily. However, if you plan to expand your business in the future, then select a more generic name that can be used in any niche. Your clients are very important to consider when you decide on a name for your photography business. After all, if your name doesn’t resonate with your ideal client, you could lose out on potential business. To appeal to locals, take inspiration from a landmark, a street name, a state flower, or a symbol that holds a special meaning with the residents. 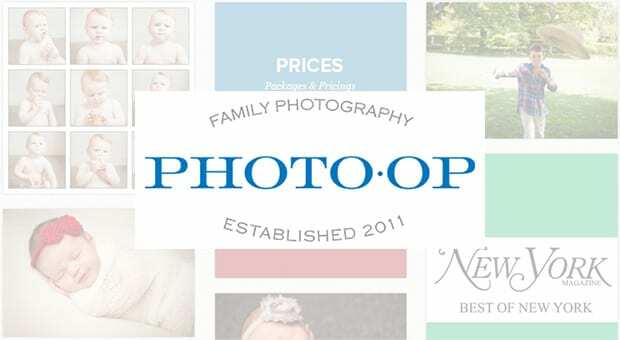 One photography studio in New York City (founded in 2011 by former lawyer, Nathan Gindi) focuses on Family and Children photography, with exceptional customer service. The name of the studio, “PhotoOp”, was aptly chosen. It calls to mind those special moments when you are experiencing the world with your loved ones, and you see the perfect opportunity to snap a photo. As the name suggests, Gindi captures these fleeting moments, which are so precious to his ideal clients (parents with young children). Think about the needs and desires of your particular clientele, and you’ll start to think of ideas for a good name. How did your photography business get started? Your personal journey into photography, and the story behind your business is a great place to look for inspiration for your business name. You don’t have to have an epic story like Steve Jobs, Bill Gates, or Mark Zuckerberg who dropped out from the universities, and set up the billion dollar businesses. What’s important is that it’s your story, and that you share it. Allow your story to be significant by influencing the name you choose for your photography business. 4. Is the Domain Name Available? Before you settle on a name for your photography business, make sure to check and see if the domain name is available. This way, when people hear about you, they can easily find your website. Now that you’ve determined that your desired name is available, you are probably so excited that you want to go and register it right away! But don’t pull the trigger just yet– there are a few factors you should consider before you make the purchase, such as length, keywords, branding, the domain extension, and more. For a detailed guide on how to choose the right domain name, check out these tips and tools to pick the best domain name. We hope this article has helped you learn how to name your photography business. You may also want to check out our guide on how much does it cost to start a photography business and how to create a photography website in WordPress (step by step). If you like this article, then please follow us on Facebook and Twitter for more free photography tutorials.